Ingredients: Brazilian Pasture-Raised Bovine Hydrolyzed Collagen - Lactose & Dairy Free - Non-GMO - Low Molecular Weight For Easy Absorption - Highly Bioavailable - Tasteless, Odorless and Easily Mixes in Any Liquid - Lab Tested With Proof of Purity - Backed By Our 100% Money Back Guarantee - Silver Level Green America Certified Business - No Fillers of Flow Agents Ingredients: Brazilian Pasture-Raised Bovine Hydrolyzed Collagen - 60 Servings Per Bottle, 660 gram container (approx. 1.5 lbs) Benefits of Collagen: - Improve Skin Health - Promote Younger, Firmer Skin - Support Joint Health - Improve Gut Function and Digestion - Keep Excess Inflammation in Check - Build and Restore Muscle - Support a Healthy Metabolism - Keep Appetite In Check - Promote Healthy Brain Function - Promote Deeper Sleep One 11 gram serving of Perfect Hydrolyzed Collagen has over 10 grams of protein (dissolved in hot or cold beverage) and no sugar, fat or carbs. 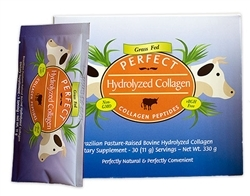 In fact, our Perfect Hydrolyzed Collagen tests out at 97% protein – the highest in the industry.